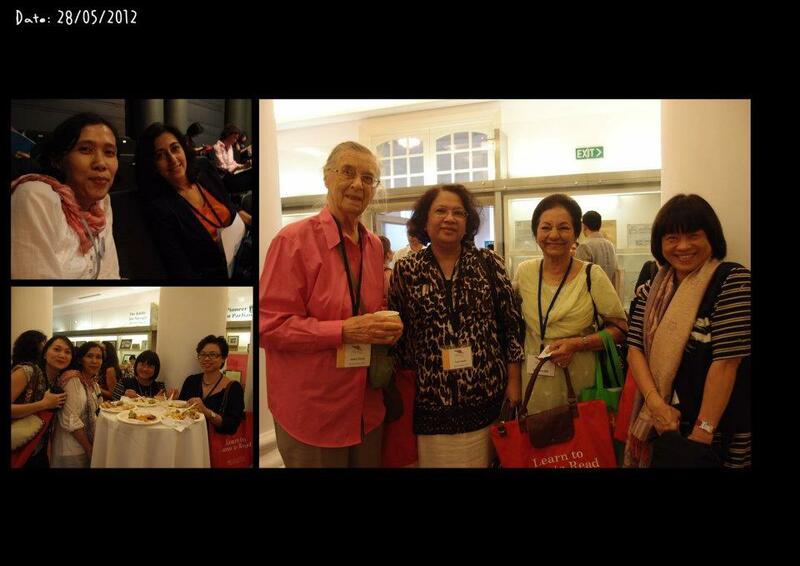 On 31 May 2012, I took the express bus to Singapore to attend the Asian Festival of Children's Content. 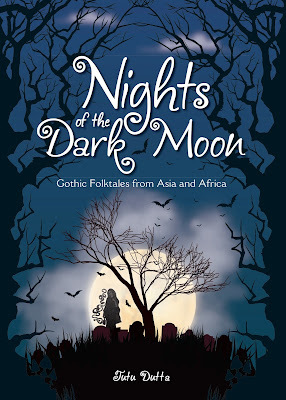 It was a lucky confluence of events that brought me to Singapore - we were required to fly from Zagreb to KL 'post-haste' in mid-May when I received an email from Tan Vay Fern about the Asian Festival of Children's Content which was only two weeks away! The venue was The Arts House, which was quite close to Chinatown. So I registered online, booked a room at The Inn at Temple Street and got the return bus ticket to Singapore. In Chinatown - photo courtesy of Tan Vay Fern. We had fatty crabs for dinner at the restaurant in the background! As I haven't visited Singapore for at least 15 years (we lived in Singapore from 1992 - 1995 and my daughter was born there), I was truly impressed with the changes I saw. It wasn't the ultra-modren architecture or the orderly streets - it was the greenery everywhere and the lack of pollution and congestion. Even modren high-rise buildings had terraces with flowering plants and some had roof gardens or even had climbing plants covering their walls! I had heard about their famous tagline - 'the garden city' - but I didn't think they could turn it into a reality. Hard to believe, but I met Vay Fern in person for the very first time in Chinatown, Singapore! Although we had collaborated on Eight Treasures of the Dragon, it was entirely via email. I had heard of her before and knew that she was a young and successful illustrator, with at least eight children's books published to date. After a lot of walking along the colourful and busy Temple Street, we decided to have fatty crabs at a nearby restaurant for dinner. I had forgotten how scrumptious fatty crabs could be! The last two days of the AFCC, which took place at The Arts House was exciting, mainly because I got to meet people I've only known on Facebook. The talks were great too but I noticed that some of the speakers used it as a platform to promote their own books rather than impart information/tips and a few were only recently published. I was also agrieved by the fact that there was no wifi at the venue! But the fact that it was being held at a historic building - the former Parliament of Singapore -made it quite special. 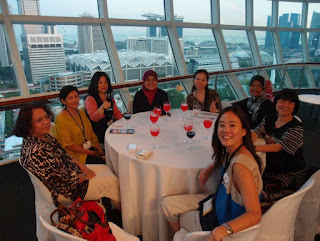 The AFCC was a great opportunity to network - there were old friends like Dr Gwen Smith, and acquintances like Linda Tan Lingard (from the Yusof Gajah Lingard literary agency) and Daphne Lee (author/columnist/editor at Scholastic Malaysia). And people I met for the first time: Yusof Gajah, celebrated illustrator of children's books and his wife Zakiah; Teoh Choon Ean, the only author I know who actually makes money from writing books (in English); Quek Sue Yian, young and talented author of 'Khailash', a picture-book about a refugee zebra, illustrated by Khairul Azmir Shoib (Sue had a book launch and I bought a signed copy of Khailash, ); Mohana Gill, award-winning author of cookbooks,Vegemania and Fruitistic, and the 'Hayley' cook books for children; Naomi Kojima, a well known illustrator from Japan who bought a copy of my book 'Timeless Tales of Malaysia':); illustrator Isabel Roxas, Cecilia de la Campa from Writers House Inc; Sayoni Basu from Harper Collins India; Tarie Sabido, (an FB friend whi didn't recognise me) and a blogger from the Philippines; Salwah Abdul Shukor, a lawyer whose dream job is to write children's books; Denise Tan from Bookaburra (what a brilliant name for a book store); Shobna Janardanan from ASTRO, Rafilda Rahman from the SCBWI Malaysia; and last but not least Norhayati Razali from the Malaysian Book Council. The highlight for me was the dinner at the penthouse of the National Library -great company, great food and what a view! Will I attend the AFCC again? For sure, especially as they are going to focus on Malaysia in 2013! I'm glad to have finally met you in person, Tutu! Love all your books and hope we will meet again next year! Thanks for the support, Vayfern! Yes, hope to meet again in Singapore next year for more fatty crabs (my treat this time)!